Come on a Chindwin River Cruise and get to know a world with a colourful history, steeped in Buddhist influence. Along the Chindwin you will be able to discover the typical features of Burmese culture and life. The Chindwin, at about 840 km in length, is a tributary of the Irrawaddy in Myanmar. It rises in the north of the country and is navigable for about 650 km of its length before it finally discharges into the Irrwaddy close to the city of Myingyan. The best time for a Chindwin River Cruise is between November and April. The Chindwin is navigable from the town of Homalin. 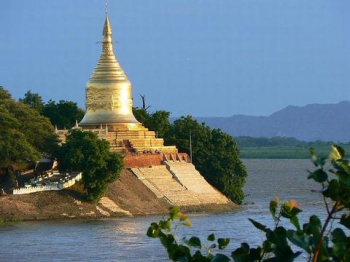 Further downstream you come to the city of Monywa, a large centre of trade, commerce and agricultural production. Worth seeing here is the Buddhist temple of Mohnyin Thambuddhei Paya, originally built in 1303 and reconstructed in 1939. Natural scenes and landscapes shaped by the Indian monsoon, fertile soil and large areas of forest, Buddhist temples and monasteries, religious statues and images - be inspired by the fascinating land of Myanmar on a Chindwin River Cruise.